Some people don't understand the sense of football; they don't get any pleasure of watching eleven players kicking the ball, and are bewildered by the high salaries of the football players. Other people support their favorite team with all heart and put impressive sums and bet whether this or that country wins the match. In 2018, FIFA World Cup began in Russia, so the biographies of the football players became even more demanded among the readers. Life of the football players doesn't only consist of the training on the field, but they also have lots of exciting events in their everyday life. However, it is difficult to distinguish from the numerous participants of the FIFA World Cup. 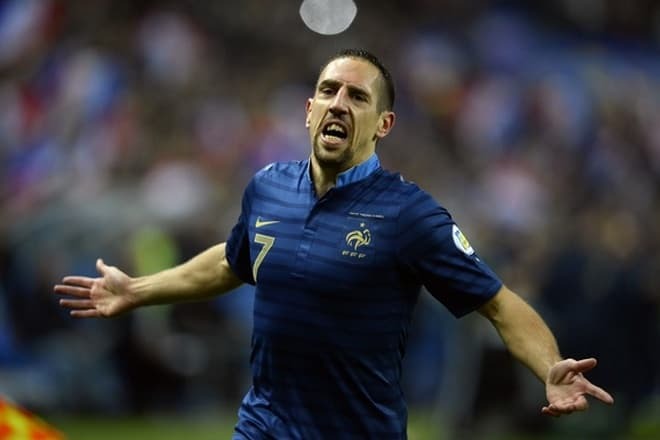 But Franck Ribéry, the French football player and the winner of multiple awards managed to achieve success in it. The future footballer was born in France on the 7th of April, 1986. He spent his childhood in the small town in the north-west of the country of Cézanne and parmesan - Boulogne-sur-Mer. The family of Ribéry lived on the periphery of this small town, in the poor neighborhood. Unfortunately, there is no information about Franck's parents. His father worked in the local company which was laying the pipelines. When the boy was two years old, a terrible event happened to him which predetermined his future destiny. It seemed it was an ordinary day. Though, Franck together with his parents had had a car accident: by the fatal coincidence of the circumstances, their car crashed into the truck. 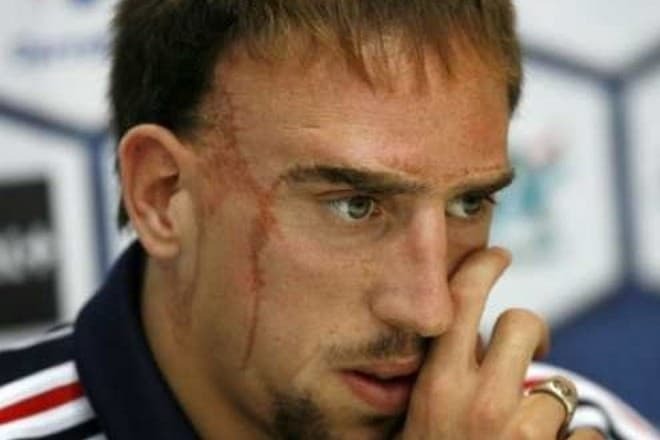 It's worth noting that this accident left the traces not only in Ribéry’s memory but also on his face. He has a scar on his face: at the moment of the car crash, Franck hit his head against the windshield. The man believes that this incident brought him strength and courage. Instead of giving up, Franck began to work hard to achieve his objective without paying attention to his injury. This accident, when Ribéry was within an inch of his life motivated the man to achieve the desired results. 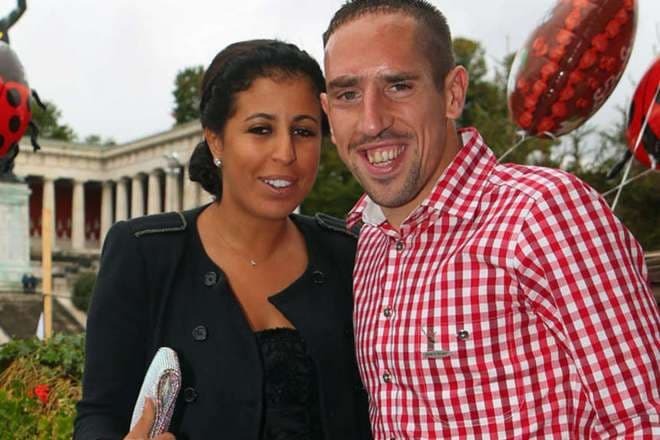 It's remarkable that Ribéry got propositions to have plastic surgery on his face, but he refused. Not without reason speak, that the scars look good on the man. "Scars are a part of me. People have to accept me the way I am" - stated the player of the French national team in the interview. 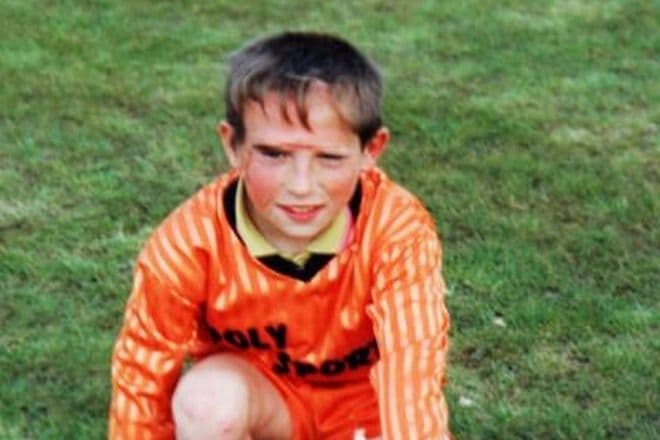 Since childhood, the football player knew that he would become a football player. However, his family financial state didn't allow to send the boy to the sports school. So, Ribéry had to kick the ball on the concrete playground behind the house. When the boy turned twelve, he became a member of Lille football academy. The future player of the FIFA World Championship achieved results in the sport, but he had to sacrifice his progress in his studies at school. It’s also known, that Franck was the eldest child in his family. That’s why he had to cook and clean the house, and also to look after his younger brothers and sisters. In a short time, the young man left the team. Also, he had problems with the discipline: during the training, he broke the elbow to another football player. Moreover, the director wanted to expel him from the academy because of his low height: the adult man is 170 cm high and weighs 72 kilos. From further footballer’s biography, we know that he became a member of the semi-amateur Boulogne football team, which played in the third division of French Ligue 1. Franck Ribéry has managed to make a career. 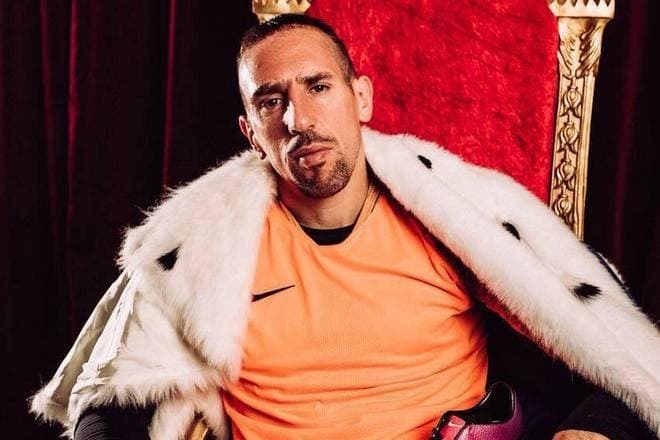 Not without reason, the coach Zinedine Zidane called this football player "the pearl of French football," because Ribéry brought his team many goals, and also took prizes of Golden Ball Awards. 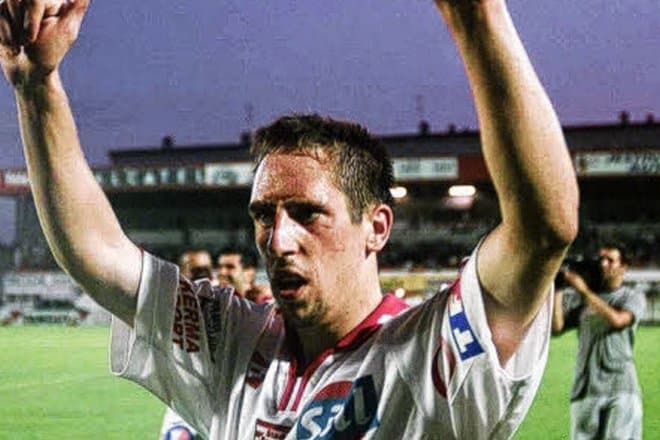 There is information that in 2002 Franck Ribéry became a part of another football club of third division - Olympique Alès. But the football player didn't remain in one place for a long time and transferred to other teams trying to find his place in the sun. That’s why in a year Franck became a member of French Stade Brestois 29 football club. As a result, Jean Fernandez became the coach of Ribéry. Earlier, Jean was the supervisor of Metz FC. This team represented the highest division of the French League 1. 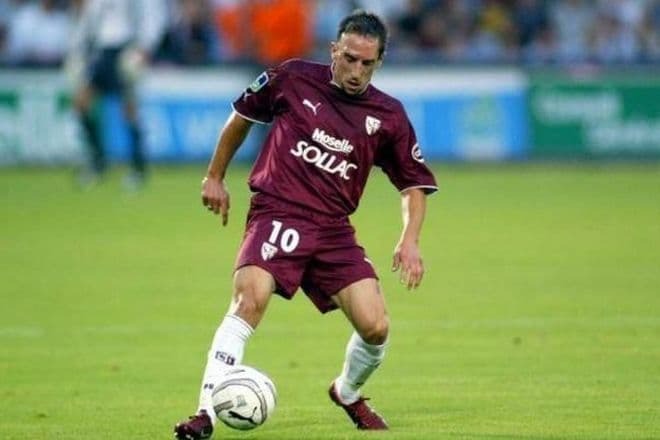 By the way, the coach was somewhat surprised that Franck Ribéry did not have a professional contract with Stade Brestois 29 football club, that's why he could transfer to Metz FC without any payments. That's why in 2004 the football player concluded the working agreement with the football club. This way he skipped several steps at once: the football player who was a member of amateur teams became the owner of the contract with the high-end French football club. Thus, having debuted in the professional team, Franck Ribéry has played 12 matches in Premier League. Due to his love for football and his professionalism which he has developed since childhood, the man became the club's leader. Then the French football player took the next step in his career and became the member of the Turkish Galatasaray football club. This club purchased him for € 2.5 million. Franck Ribéry presented himself positively and showed his strong sides. Though, we can hardly call his participation and career in this Istanbul club successful. It is the fact that there burst out the scandals connected with journalistic investigations around Galatasaray. That's why the team didn't get the expected profit. The football players didn't get their salary, what led to the strike. 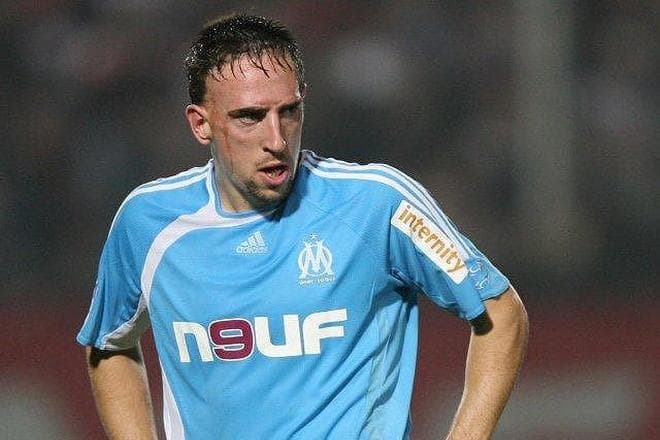 It happened that at the end Ribéry broke the working agreement and transferred to Olympique de Marseille FC. In 2006, Ribéry distinguished himself in the French team. Being a member of Olympique team, Franck reached the final of FIFA World Cup in 2006 and also won the silver medal of FIFA World Cup. During the season of 2007-2008 Ribéry played for Bayern Munich FC. Franck dreamed of joining the team of Manchester United and Real Madrid. Unfortunately, because of the high transfer rate, these clubs refused to take the new player. However, Bayern Munich which was radically changing the team’s structure at that time accepted this high rated offer. In Bundesliga Bayern Munich has taken only the 4th place according to the results of the last season and it was a real shock for the Munich football club. That's why the direction of the football club decided to spend a hefty sum for the purchase of new players. They purchased Ribéry for the record rate, which reached € 25 million. They concluded the four-year contract with the footballer, and Ribéry 's annual salary amounted at € 4 million. The footballer was playing under the lucky number - 7. At FIFA World Cup 2008 Ribéry got injuries - torn ligaments of the ankle. That is why the footballer appeared in the new season in Bayern Munich only in late September of 2008. With the results of the matches, the player took the third place after Cristiano Ronaldo and Messi. The same year, the French player got the nomination for the Golden Ball Awards (2008), which was awarded by Ronaldo. In FIFA World Cup, Barcelona FC defeated Bayern Munich with the score of 5: 1. It was Ribéry, who has scored this only goal during this match. "This is the place where I feel free and where I am the best", the man admitted in one of the interviews. Also, the footballer can play as a forward and on the position of the attacking midfielder. It’s noteworthy that people often compare this player with his colleague Arjen Robben. What about his personal life, we know that he married an Algerian girl - Wahiba. For his beloved woman, the French player had to adopt a different religion, to convert to Islam and to take a new name - Bilal Yusuf Mohammed. The spouses have three children. 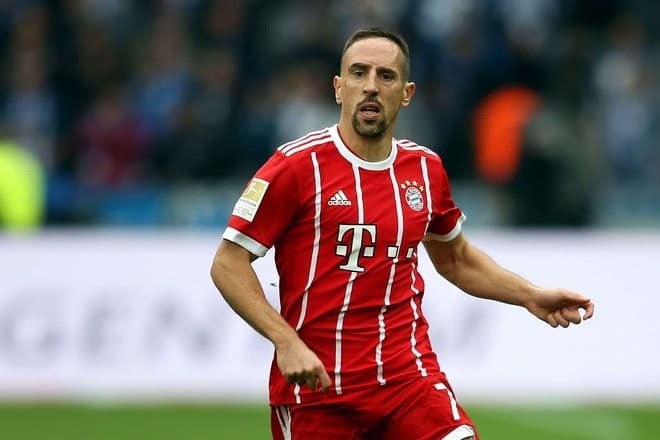 Happy family life of Ribéry turned out to be at stake: the man betrayed his wife with the young girl of easy virtue - Zahia Dehar. It’s remarkable that after this story of the betrayal there burst out the scandal, which could cost the footballer his career. Fortunately, Ribéry is a regular Internet user. To the luck of his fans, they can find him in the social networks of Twitter and Instagram. Frank Ribéry began the season of 2017-2018 successfully. The player won the DFL Super Cup, defeating Borussia team with the series of penalty. When Ribéry was playing in UEFA match against Anderlecht, he was replaced at the 78th minute. Frank was against the referees’ decision, that’s why he took off his shirt in anger and threw it on the bench. After that, the emotional footballer apologized to the coach for his behavior.